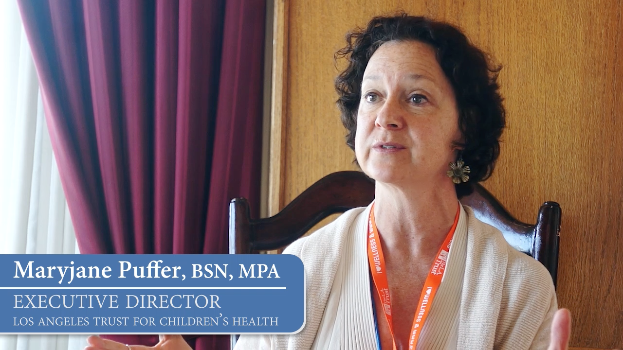 An important message from Maryjane Puffer, Executive Director, Los Angeles Trust for Children’s Health. Sorry, your browser doesn’t support embedded videos. Download it instead. Mobile Dentists far surpassed my expectations. The staff was warm and gentle with the students, while being highly efficient and effective. I was quite impressed with their speedy set up and compact equipment. Our school is very old, and they were able to utilize a very small space to turn into the “dentist office”. In addition, their office staff took care of everything in terms of paperwork. They verified insurance, contacted parents for more information, and supplied families with grant paperwork. Thank you Mobile Dentists for a wonderful experience; I know we will be seeing you again next year. Smile New York is a wonderful in-school dental prevention program. Our students were engaged and excited about the dentist visiting. It was beneficial to have so many of our students receive dental health services and walk out with clean and treated teeth. The dental staff was caring, supportive, and professional. Our overall experience was great! Wonderful, kind, fast and efficient! Thank you for coming and providing your services to ensure the dental requirements and health of our children are met at Head Start! The dental team has a wealth of expertise in pediatric dentistry and ensures students have a comfortable experience. They eliminate the fear some students may have of going to the dentist. The team also informs me of the most severe cases, so I may follow up with the parents to ensure restorative care is executed. Great job Big Smiles Dental! This was our first visit from the Smile Programs team and we were extremely pleased with the services we received. The team was on time, professional, patient, and kind with our children. I am looking forward to our 6 month follow up and hope that our participation will continue to increase. Your staff was really kid friendly! For some children this was their first experience with the dentist and the Smile Pennsylvania dental team really gave our children excellent dental services. Stephen Girard Elementary School in Philadelphia looks forward to your visits in the future. Dr. Cindy and Dawn are wonderful! They are great at easing the minds of the frightened kids. What a great program! I would encourage all schools, especially elementary schools, to try it out! The staff is very friendly and provides a great service to our students. You all were great! I loved how they comforted each one of the children. The staff were very efficient and organized, and the program ran smoothly. Everyone was wonderful and the dentists were friendly and professional. We are so thankful for the wonderful dental care your organization provides to our students. Many would not receive any dental care if it were not for the Mobile Dentists. Dental staff were helpful and pleasant! The office staff remarked about how self sufficient you all were in gathering the necessary students and contacting parents! Thank you! It is a pleasure to work with an efficient and caring team! This program goes above and beyond, and they are professional and compassionate about what they do. We are grateful for this program! Every comment I heard about the program and staff was overwhelmingly positive! The residents are so appreciative of the care they receive. The “team” are true professionals and work extremely well together. Thank you so much for seeing the children! This service was one of the best resources that our school could have used. There are always so many students who don’t have a dentist and the parents don’t know where to go to get help for those students who need dental help. It’s so great that the dental team can come to the school to service the students. The school staff and parents thank Smile Programs so much for coming to help our students. We are very thankful for your program. We have several students who would not see a dentist if you did not come to our school. Thank you very much! Efficient, friendly, flexible, and prompt! The hygienist came in to greet the office staff first thing in the morning. A few times I walked by the room where they were set up, and for a mobile unit it is an extremely professional set up. It was a pleasant experience for the staff and children. Thank you for a wonderful service to the community and children. We are VERY pleased to be able to offer your services to our students. Thank you so much! The service was excellent, and we want to thank you so much for bringing your program into our school. Your staff did an excellent job working with our nurse and office staff. I can’t say enough about your staff! They are so wonderful to our parents and students here at Collins! They are a joy to work with! Professional, friendly, and wonderful service! That’s my experience with Mobile Dentists. The Big Smiles dental services were excellent. The dental team worked very efficiently and diligently when providing services to our students. I was impressed with the services provided to students on the spot in the school setting. Love the team of Joi, Dr. King, and Pam….and others! You guys rock! So great with the students! The staff was always wonderful, very professional, and kind to everyone. I wouldn’t have any other business come to my school to provide this service. Your company beats my expectations by a mile! I was able to call (daily almost) and get the answers I needed with no hassle. Suzie was wonderful, very attentive, very knowledgeable, and just overall wonderful! The past two years have been great with the Mobile Dentist Program, and I look forward to many more. It is always a pleasure to have your services and help the kids of Baltimore City. I am grateful to know that an organization such as yours will provide a much needed dental health care need, now and in the future. Excellent service to our students! Professional and friendly staff that are easy and understanding to work with. Overall, kids are excited when they come. The Mobile Dentists program is such an asset to my students in delivering dental health care, helping to keep absenteeism down, and health habits up! I will definitely have the Mobile Dentists visit our school again! he dental team arrived on time and had their equipment set up and ready to go promptly. They were very professional and explained everything that was going to happen to the students before they began their individual tasks. We had some first time students who had never been seen by the program before, and they put those students as well as the others at ease. We would recommend them to any school. They were kind and welcoming to everyone, including staff who stopped in to see how the program works, and volunteers who helped coordinate the flow of students back and forth from the classrooms for treatments. Thanks again for coming and seeing our students! We appreciate the professionalism, kind words, and dental teaching you provided them! The program is so easy to work with and all went well and ran smoothly! Always a pleasure to deal with and they always do a wonderful job! The Smile Program is a wonderful service for students and parents who are on the go and just can’t seem to find enough time in the day to make that most needed dental stop. I would recommend this program to everyone that I know because the staff is very friendly and highly professional at all times. Thanks Smile Programs for servicing our students here at Emerson School. We’re looking forward to your next visit! The dentists and dental hygienists are always friendly and very patient with the students. They give the kids positive feedback on their behavior during the exam and procedures. The staff worked extremely well with our 3-5 year old students and our autistic students. They are always pleasant, well organized, and efficient! Always great with the students, and a pleasure to have. My school really benefits from this program on our campus. The dentist and hygienists were very thorough seeing students. Many students told the nurse how nice they were and it “didn’t hurt at all!” They took time with the students and were not trying to hurry them out the door. Our students had many dental issues…having this service available has been wonderful! We even had students from other schools in our district the dentist previously saw that were having issues. They immediately saw the student and addressed the concern! The staff did a wonderful job this year with the elementary and middle school students! They were friendly and very efficient with their time. They treated 40 students, which I believe was a record year for us! Friendly staff and great service. A wonderful program that supports our community with a great smile. We appreciate the opportunity to work with the Smile Program. The friendly service the team provides helps to fill the gap in access to oral health care for children under age 5 in our community. I absolutely love that you are able to provide this service during normal school hours, ensuring our scholars are being seen and their dental needs cared for. Every year, your staff is always kind and efficient! I am very pleased that some of our students opted to participate because this very well may be the only dental visit they get. Thank you! What a WONDERFUL service for the children in our district. The staff was so friendly and made the children feel safe and comfortable! For many children this was their first time seeing a dentist or having any dental work done and they all did so well, because the dental team was so great. We are looking forward to your return visit. Every year, over 51 million school hours are lost due to poor oral health. Big Smiles Dental addresses this national crises by offering in-school dental care, bringing the care to the need at NO COST TO YOUR SCHOOL. © 2019 Big Smiles Dental. All rights reserved. Sorry, your browser doesn't support embedded videos. Download it instead. Schedule a Visit	Call Us!